Chances are high that whatever your question is, someone else has asked it. Here is a list of most common questions, and the answers to them. A more comprehensive list of How-To articles can be found on the forum here. Note that you will have to sign in to view this section. 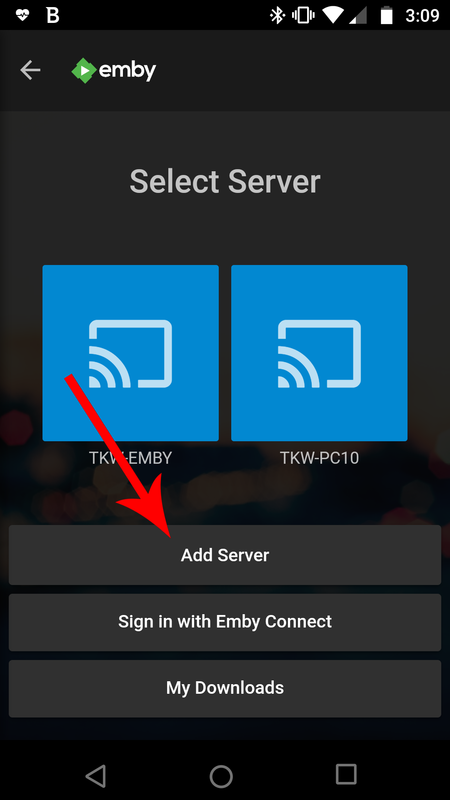 I've downloaded the Emby app on my device, how do I connect to the server? This is a 3 step process. When you first open the app it asks you to sign in. DO NOT SIGN IN HERE. 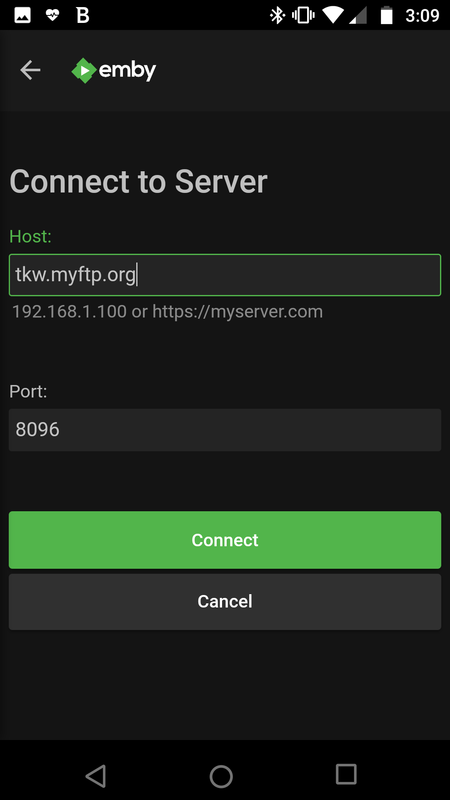 you have to Skip this step and connect the app to my server first. Do these steps in order. Why are you using a forum now instead of just putting everything on the regular website like before? Mostly for privacy. This website is public. Anyone on earth can come to this page and see what is written here. I can't post exact and specific instructions on how to access my content on such a page, as then obviously anyone would be able to then use the server. On the forum, you can only see certain sections after you login. This allows me to put out more specific information that only my users can see. In addition, the forum platform is more easily searchable and organized, not to mention the ability for feedback and more community involvement. Request it. Use the email you registered when you applied. Your username and password will be emailed to you by the bot. The Movie I am watching needs subtitles or has the wrong audio, what's up with that? When you buy a BlueRay, chances are high it will come with different audio tracks with different languages. These files are no different. Often times, the default audio track is simply set to the wrong language. Check for a different audio track before filing a ticket. If a movie or show needs subtitles, make a thread here and request it. Subject line should be something like "Name of Movie - Requesting subtitles". I can't always find them but i'll see what I can do and reply to the thread with info. Depends. First thing run a speed test on the device you are using. If you are downloading at anything less than 10Mbps, that is likely your problem. There are several factors for this issue. It's important to narrow down whether the problem is on your end, or mine. That is the main goal. In order to see if it is something on your end, here are some things you can do. 1. Try a different device. Use your computer or your phone, just try a different device. If that decide works, then you know it's not the server. 2. Play a different file. If several different files play without issue, then it is likely an issue with what you were trying to watch. Report it. 3. Don't use WiFi. Try watching on something jacked in using Ethernet. WiFi isnt always consistent enough in it's connectivity to allow streaming files of this size over the server. If it works fine over ethernet, your Wifi needs more beef. 4. Ask in the Discord channel. If others are also having similar issues, you know it's the server. This is usually due to too many people streaming at once, or maybe my internet is just being garbage. Literally all of these applications and services are running out of my server room at my house. If my internet connection is being flaky, you'll feel it. What devices can I use to watch the server? If you are using a desktop computer, use Kodi or Chrome. Chrome works decent enough. Kodi takes a bit of effort to set-up, but is easily the most powerful method of accessing the server, and what I use personally. Highly reccommend for several reasons. See all the info you need about Kodi here. A complete list of all compatible devices can be found here. I don't currently have a user account. Can I join? Click the Contact button at the top and fill out an application. The answer is maybe, if I know you. User slots are limited.